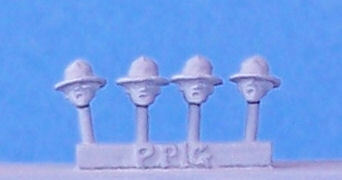 any company produce 15mm US infantry figures in the campaign hats? I would like to do the Pershing Mexican Punishment Expedition of 1916. Minifigs does a marching pose, and some action poses in a side cap. There's nothing purpose-designed for this campaign in 15mm (maybe Blue Moon might like to consider it for a future release). In 20mm though, there's plenty of choice: in addition to Shellhole Scenics, EWM also has a range. The QRF SAW Americans would make passable Carranzistas. From 1913 on the Constitutionalists were supplied with large quantities of US cast-off SAW-era khaki uniforms, and although by 1916 a new locally-produced uniform (actually very similar to the old Federal uniform) was being issued to those former-Constitutionalist troops who'd become the Carranzista army, given the chaos caused by the ongoing internal conflict there were probably many units still in the cast-offs. The Constitutionalists tended to wear the full uniform including jacket, which is how the QRF figures are depicted.